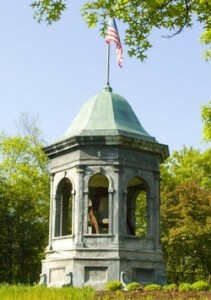 Bell at center of Newton Corner, now at Turnpike Exit 17. I live in an old house in Newton Corner. The village label, Newton Corner, is actually incorrect, it’s Newton, plain and simple. But, folks in the other villages, West Newton, Newtonville, Newton Centre, don’t want there to be a ‘Newton’ so we obligingly tack on the word corner. The Corner part of it comes from a bar. A tavern run by a fellow named Angier. The spot where he had this tavern was a major crossroad from north, south, east and west and came to be known as Angier’s Corner. I guess after taverns were no longer the most important landmarks in town, the name was changed to Newton’s Corner and in time Newton Corner. The post office, and tax collector just call it Newton. As I said, it is an old house (by American standards), built around 1820, somewhere on Washington or Richardson Streets. In 1890 a decision was made to lower the train tracks on the Boston-Worcester-Albany line that parallels today’s Massachusetts turnpike, and residents were allowed to move their houses a few blocks north. That’s how my house ended up catty-cornered on its lot, and slightly crooked on its foundation. The house used to be a side by side two-family with coal stoves in the diningroom and livingroom of each. These would heat the bedrooms upstairs as well. To accommodate this coal a long chute was built down the center of the basement. The chute had two walls about a foot apart, with openings to shovel out the coal to bring up to the stoves. I’m not sure how the coal was delivered, but I imagine through one of the basement windows. When we bought the house in 1986, one of the first things we did was to take down this double wall that divided the basement, so along with the asbestos-covered pipes we removed from down there, and the tar and paint we scraped off to the stairs, we cut the old wood and swept up coal and lead paint. On one piece of the wall was an interesting chalk picture. 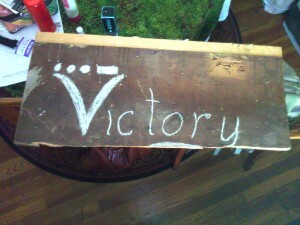 The word Victory with the Morse code for V colored within that letter. It is the only thing we saved from that project. The basement windows had been painted black since December 8, 1941, but Jimmy didn’t mind. Not only was he safe from Germans and Japanese who might want to bomb a town where so many MIT engineers lived, but the neighbors wouldn’t know when he was up all night working on his ham radio. He’d been twelve when the war started; there were days when he hoped it would last long enough for him to join, but not when his mother got that frightened and worried look in her eye. Now he was fifteen, almost sixteen, and had come to believe that the war had gone on long enough. His father had introduced him to ham radio, before he left for Europe, when he was ten. And there wasn’t an afternoon that he wasn’t buying parts for that radio or tinkering with it somehow. Nights were when he would listen to transmissions from vessels off the nearby coast and pass on interesting things to radio partners further inland. That was how our Jimmy came to be listening one night in April 1945. 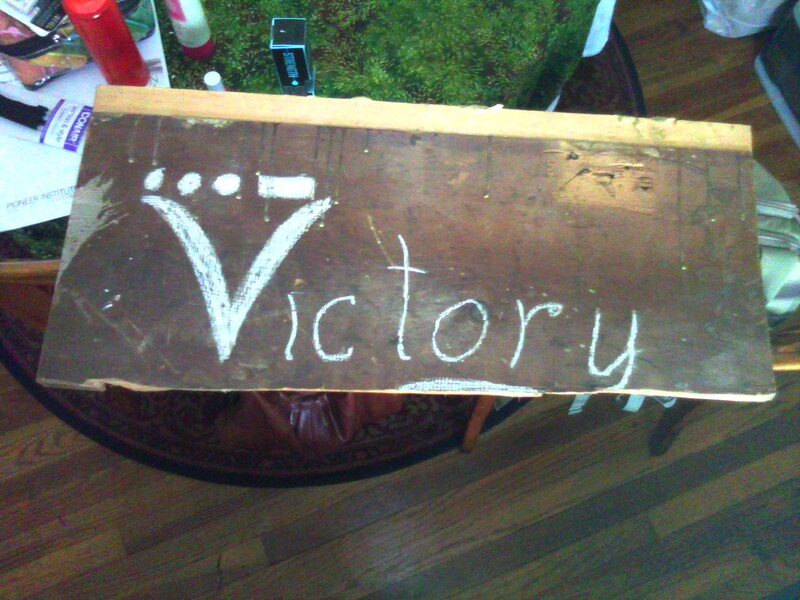 The news wasn’t public yet, he probably got it two or three minutes before NBC, CBS or ABC broadcast it, but when it came over his ham radio in the little two-family in Newton Corner, Jimmy picked up a piece of chalk, the only thing he had at hand, and quickly wrote the word that came across his radio… ‘Victory’. Then Jimmy ran upstairs to wake his mother.